Guatemala grass has long been referred to as Tripsacum laxum Nash in the literature, but it is now considered that plants once described under that name belong to Tripsacum andersonii J. R. Gray. As of 2013, GRIN recognizes Tripsacum andersonii J. R. Gray as the main Guatemala grass species, with Tripsacum laxum Nash as a distinct species. However, the situation remains confusing. Notably, the USDA only recognizes Tripsacum fasciculatum Trin. ex Asch. and considers Tripsacum laxum Nash to be a synonym (USDA, 2012; Cook et al., 2005). This datasheet uses the name Tripsacum andersonii but it should be understood that the literature, which mostly refers to Tripsacum laxum, may actually describe either Tripsacum andersonii or different, but closely related, species, including Tripsacum laxum. Guatemala grass (Tripsacum andersonii J. R. Gray or Tripsacum laxum Nash) is a robust, strongly rhizomatous, tufted and leafy perennial grass that can form large bunches. The stems can be up to 3.5-4.5 m high and up to 1-5 cm in diameter. They develop at a very late stage and Guatemala grass remains leafy for a long time. The roots are shallow and the plant does not grow well during a long dry season. As the grass matures, the roots become stronger and store nutrients that will be necessary for regrowth after cutting (Bernal, 1991). The leaves are tall (0.4-1.2 m long x 9 cm broad), glabrous or sparsely hairy (Quattrocchi, 2006; Clayton et al., 2006; Cook et al., 2005; Bogdan, 1977). The inflorescences are subdigitate with 3 to 8 slender, elongated racemes, up to 20 cm long, containing male and female spikelets (3-5 mm long). Flowers are mostly sterile and Guatemala grass is usually propagated by stem cuttings or tuft division (Bogdan, 1977). Guatemala grass is cultivated primarily for fodder in cut-and-carry systems. It can also be used to make silage. Guatemala grass provides several environmental benefits, notably against soil erosion and the development of pests and diseases in neighbouring crops (Cook et al., 2005). Guatemala grass originated from Mexico and South America and has been introduced for fodder in many tropical countries. It is a warm season grass that grows from sea level up to an altitude of 1800 m, at temperatures ranging from 18 to 30°C. It does better under good soil moisture but can withstand short droughts. It is intolerant to waterlogging and flooding. It can grow on a wide range of soils (including podsols, ultisols, oxisols, peats, acid sulfate soils and very acid coastal marine sands) and withstands low pH and the presence of Al, provided the soils are well-drained (FAO, 2012; Cook et al., 2005). Guatemala grass is usually propagated from stem cuttings or rooted culms at the beginning of the rainy season. The first cut can be done 4 to 6 months after planting. Guatemala grass can be planted with fast growing twinning or shrub legumes such as Desmodium intortum, Desmodium uncinatum, Calliandra calothyrsus, Leucaena leucocephala, Leucaena diversifolia and Sesbania sesban (Cook et al., 2005; Akyeampong et al., 1996). The association of Guatemala grass with Leucaena diversifolia or Calliandra calothyrsus produces as much DM as Guatemala grass alone and improves the production of digestible protein (Akyeampong et al., 1996). The average DM yield is about 18-22 t/ha/year (Cook et al., 2005). In the eastern highlands of Africa, yields ranging from 9 to 50 t DM were recorded (Nivyobizi et al., 2010; Mtengeti et al., 2001). Since most of the biomass is produced during the wet season, it is generally recommended to use Guatemala grass in cut-and-carry systems (Wandera, 1997). It can also be stored as silage for dry season supply (Sarwatt et al., 1992). Smallholder dairy producers in the highland areas of East Africa (Kenya and Tanzania) have been encouraged since the 1970s to grow Guatemala grass as a high-yielding fodder (Myoya et al., 1988; Boonman, 1993). However, such initiatives have met with a mixed reception: in Kenya, when compared to other forage species evaluated for herbage dry matter yields and farmer acceptance, Guatemala grass was ranked lowest, mainly because of foliar diseases and poor regeneration after defoliation (Muyekho et al., 2003). When harvested for direct feeding in cut-and-carry systems, Guatemala grass should be cut when it reaches 100-120 cm high and not closer than 10-25 cm from the ground. Guatemala grass does not withstand heavy grazing or frequent cutting. Cutting frequency should be about every 30 days during the wet season and every 42-45 days during the dry season. It has higher persistence than elephant grass (Pennisetum purpureum) but lower yield and nutritive value (Cook et al., 2005). It is sometimes recommended to let Guatemala grass completely establish by not harvesting in the first year after planting. This encourages the perennial nature of Guatemala grass and results in healthier regrowth (Vargas-Rodriguez, 2009). When Guatemala grass is intended for silage, it is recommended that the regrowth (after first cut for direct feeding) reaches 0.8-1 m high but is still in the vegetative state (8 week-old). Ensiling Guatemala grass results in 12% DM losses during the process (FAO, 2012). Guatemala grass has a relatively high moisture content (69%) and a relatively low content in water soluble carbohydrates (3 to 9% DM) (Sarwatt et al., 1992), which can result, as in most tropical grasses, in ineffective pH reduction during ensiling and a low storage stability (Webster et al., 1980). It is thus recommended to wilt the Guatemala grass before ensiling in order to increase dry matter and the content of water soluble carbohydrates and to reduce nutrient losses through lixiviation (McDonald et al., 1991; Humphreys, 1991; Nussio, 2005). Wilting combined with chopping may increase the availability of water soluble carbohydrates to the fermenting micro-organisms, increase crude protein content and slightly decrease NDF and ADF contents (Lavezzo et al., 1989). Guatemala grass is used for hedges or for contour stripping of cassava crops planted on steep slopes. Guatemala grass is a good soil binder and organic matter builder (FAO, 2012). In the highlands of East and Central Africa, it is used to combat soil erosion and increase the stability of contour bunds (Akyeampong et al., 1996). Guatemala grass is more effective at controlling soil erosion when combined with companion trees such as Sesbania, Grevillea or Desmodium (FAO, 2012; Bationo et al., 2011). Guatemala grass can be used as mulch to improve soil (Cook et al., 2005; Rao, 2000). In tea plantations, Guatemala grass mulch increased 3-year-old tea yields by 10% (Sandaman et al., 1976). Guatemala grass helps to control weeds, which, in turn, results in a reduction in nematode infestation. For instance, it is used in tea plantations for rejuvenating soils during fallow and preventing Meloidogyne nematode infestations (Naturland, 2000). In Burundi, Guatemala grass has been used to reduce bacterial wilt in potato plantations (Cook et al., 2005). Though contour stripping with Guatemala grass has many advantages, it is reported to harbour more rodents than other grasses, causing a potential health hazard (plague) (Kamugisha et al., 2007; Mati, 2006). Guatemala grass has a relatively poor nutritional value, with a protein content generally lower than 10% DM and a high fibre content (average NDF more than 70% DM). It is also low in DM (average 22% DM), which increases over time while the nutritive value decreases (Azevêdo et al., 1974). An important feature of Guatemala grass is its ability to remain leafy at a very late stage of development: for instance, a one-year-old Guatemala grass contained 15.5% DM and 8.8% crude protein (Vargas-Rodriguez, 2009). Reported digestibility (in vitro and in vivo) of Guatemala grass is generally low, in the 50-60% range, though highly variable. In vitro digestibility of Guatemala grass cut between 7 and 12 weeks of age was found to range between 47 and 56%, but could be as high as 72% when cut young (Wandera, 1997). When Guatemala grass silage and hay in vivo digestibility was compared in Indian bullocks, it was found that silage had a better nutritive value than hay: DM, protein and crude fibre digestibility were respectively 60%, 59% and 51% for silage, and 55%, 59% and 44% for hay (Das et al., 2000). In Burundi, OM digestibility was found to be between 44-67% (Pozy et al., 1996). In Burundi, the intake of Guatemala grass alone (0.64 UF and 47 g/kg DM of PDI according to the INRA feeding system) could only meet 78 and 73% respectively of the energy and protein requirements for maintenance of steers or sheep (Nivyobizi et al., 2010). The forage obtained from the association of Guatemala grass with a legume tree (Leucaena diversifolia or Callandria calothyrsus) contained relatively high levels of protein and provided digestible protein levels above the maintenance requirement for goats (Akyeampong et al., 1996). In Costa Rica, one-year-old Guatemala grass offered to goats (at 7.5%, 10.0% and 12.5% body weight) contained 8-9% crude protein in the DM, which was acceptable for such a relatively old forage, and provided the minimum amount of crude protein required for maintenance. Goats showed the highest consumption when fed at 7.5% body weight, though there were no compositional differences between treatments. It was estimated that younger (less than one year) Guatemala grass could result in a better nutritional content, higher intake and higher production results (Vargas-Rodriguez, 2009). In Cameroon, West African Dwarf sheep and goats gained less weight when fed Guatemala grass than with elephant grass (Pennisetum purpureum). Guatemala grass fed to dairy goats (Saanen, Toggenburg and Anglo-Nubian) resulted in a higher milk production than elephant grass (0.50 vs.0.26 kg/doe/day) with a high fat and total solid content (4.7 and 11.8%, respectively) (Fomunyam et al., 2000). In Cameroon, Guatemala grass used as dry season supplementary forage for West African Dwarf sheep and goats grazing on natural pasture resulted in lower mortality and increased daily weight gains (Ndamukong et al., 2010). 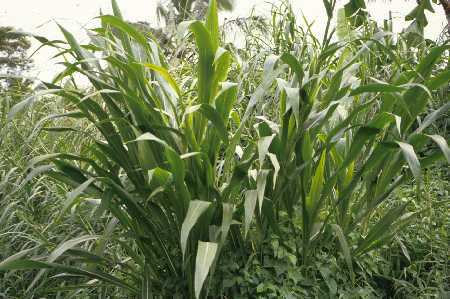 Adequate diets can be formulated by combining Guatemala grass with other grasses such as Congo grass (Brachiaria ruziziensis) or elephant grass (Pennisetum purpureum) and leaves of multipurpose trees, and could help to improve the overall productive performance of ruminants in Central Africa (Tedonkeng Pamo et al., 2007). There is little literature available on the utilization of Guatemala grass by rabbits. It is used as a standard forage by smallholder rabbit breeders in Cameroon (Tchauwa et al., 2001). Due to the low protein content of this forage, supplementation with an energy-protein rich concentrate is necessary to obtain good growth rates. Among the protein sources tested, concentrates with fish meal or soybean meal as the main source provide better results than cottonseed meal when distributed in limited quantities together with wilted Guatemala grass fed ad libitum (Mbanya et al., 2005). Akyeampong, E. ; Dzowela, B. H., 1996. Fodder production from associations of leguminous shrubs and grasses on contour bunds in the highlands of Burundi. Trop. Grassl., 30 (3): 330-334. Bernal, J., 1991. Pastos y forrajes tropicales. Produccion y manejo. Unidad de Divulgacion y Prensa. Banco Ganadero. 2ed. Bogotá, Colombia. 554 p.
Nivyobizi, A; Deswysen, A; Dehareng, D. ; Peeters, A. ; Larondelle, Y., 2010. Nutritive value of some tropical grasses used by traditional small farms in the highlands of Burundi. Trop. Anim. Health Prod., 42 (4): 561-567.